The staff are amazing. Bruce, Eric and carlos especially make you feel like part of the family. Among them speak good English and Spanish. Breakfast was great. Also out of the all the hostels I stayed at this was by far the cleanest. Bikes are 50 pesos to rent and they'll happily provide you with nearest attractions and food spots. Highly recommend!!! 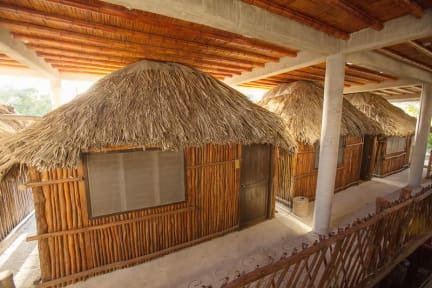 This is really authentic place to stay in Tulum especially if you stay in Tulum first time. When you compare the money you will give here and this place’s quality, you will understand you take nice service. It is close to city center. In short, I exactly advice here for accommodation. This family owned hostel was amazing! Eric took care of us right away and told us about all the good restaurants around and the activities. the then took us around to show us the facilities and he was always around if you needed something. The kitchen as everything you need to cook and everyone was very friendly. The included breakfast was appreciated since we were on a budget! We rented bikes on the spot to go to the beach and ruins it was fantastic! This hostel was lovely. Really clean and a great big kitchen and communal area. Eric was so so helpful and friendly. Definitely need to rent a bike to get around though, which is handy as the hostel has bikes for you. Would definitely recommend! 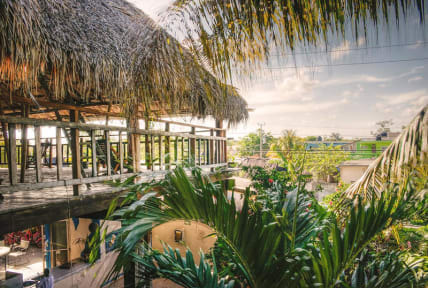 This is a great hostel especially if you are going to be busy during the day going to day tours. Breakfast was always made fresh each morning and there’s a cheap tasty taco place right around the corner. The pictures don't match the actual hostel very well. Basically you're living in a big construction site, but that isn't without charme. The dorm has no windows and looks a little shabby. The location isn't great, but you can rent bikes in-house to get around. The manager was super nice and helpful. They have a rooftop terrace which is also a construction site, but still nice to have. Unfortunately only for very very low budget Bagpackers... we stayed 4 nights and it was way too much : our room was dirty, we had old carpet as bed sheet and therefore some insects in the bed during the nights. No trash in the room and of course not housekeeping but we changed our towels when we asked. Bathrooms are also very average and not always with hot water. The building could be fine except that it is not finished. On the other the location is good and the staff nice ! Staff are friendly and helpful, and breakfast is good. However, the pictures of the place online are misleading. For one, the building is still under construction, and we were awoken daily to sounds of pounding on the roof at 7:00 am. The "plunge pool" is empty, there is no functional fireplace, and there is no "Mayan steam room." The rooftop is in shambles. Shared bathrooms are dirty and don't have hand soap. In our private room, the shower head fell off in our hands. Kitchen is filthy.